The Crew van comes with a row of lights along the ceiling. They come on when a door opens, and turn off about 20 minutes later. They’re not very bright and they are not very attractive. We wanted some other options for the space we’ll be living in. LED lights are much more efficient than regular incandescent bulbs. We decided to use them throughout because that will mean our battery lasts longer. LED 60 degree spot lights for the living area. These are semi-focused lighting for when we’re working in the living area – for instance preparing food or reading. LED white strip lights. These are ribbons of LEDs. They don’t look pretty, but if you place them correctly they provide good ambient light. We made sure ours were color balanced with the spot lights, because they’ll potentially be on at the same time. We chose warm white rather than daylight white because it’s a more friendly color and doesn’t tend to confuse your brain about bedtime so much. LED work lights in the rear doors. These are for illuminating the garage area, and when the doors are open, also for lighting up external work areas. 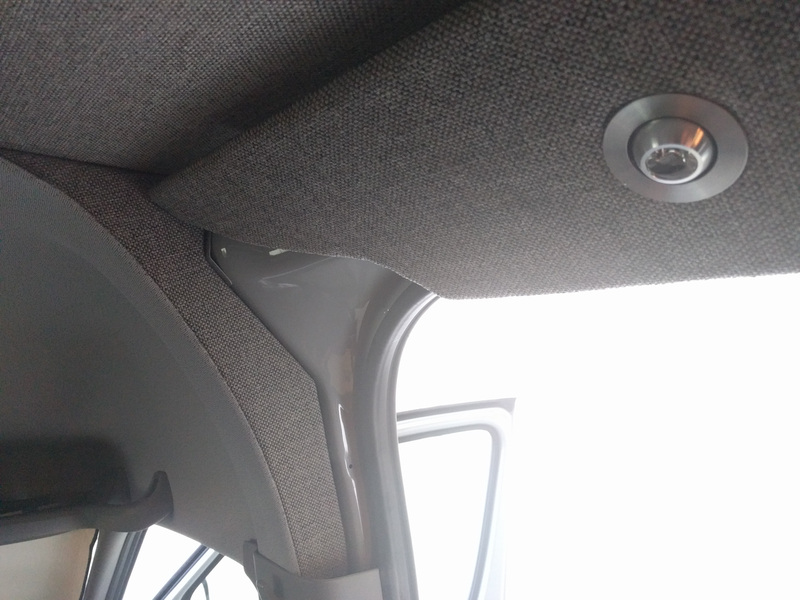 With the passenger side rear door opened 270 degrees, the light in this door shines on to the area outside the sliding door. LED RGB controllable strip lights. These lights have separate controls for the red, green, and blue channels of the light they produce. That way you can have any color from black (off) through to white. Although it is possible to get controllers that will make them pulse to music or fade through random color changes, we decided to just have a separate volume control knob for the red, green and blue channels. Red or green light are great for seeing where things are in the night without losing your night vision too badly. In the end, we also decided to keep three of the original crew van courtesy lights. It’s useful to have the capacity to switch them on automatically when the doors open, and they run from the engine battery so in an emergency we’ll have light to work on our broken electrical system. We moved them to sit in the light coving though, and swapped out all the energy-robbing incandescent bulbs for equivalent LED bulbs. LE LED white strip lights. Supernight dimmer for white LED strip lights. Supernight variable color (RGB) strip lights. Waterproof means they’re covered in clear silicone. More like “probably won’t die if you splash water on them”. Armacost Controller for RGB strip lights. Ours is quite boring and manual. There are plenty of touch screen options out there. 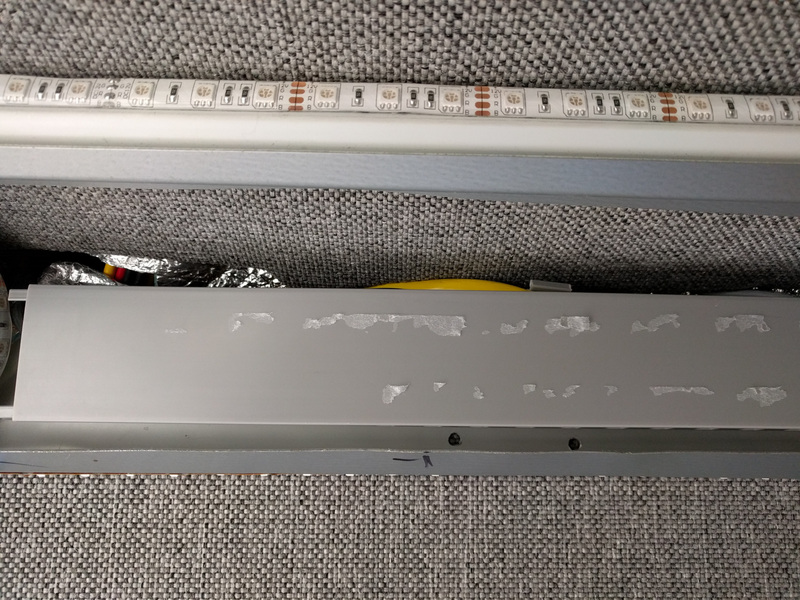 Although the LED strips come pre-wired, we had to cut them to length. Then we wanted to attach a length of wire and more LEDs in series. You can buy clip-on connectors to do that. Signstek 18W LED work lights. These are quite compact, sturdy, and they give off good light. The LEDs we used to replace the original courtesy lights are generic 9-SMD 42MM Festoon LED bulbs. They are warm white. We initially tried some bright white ones because they claimed they wouldn’t trigger the “bulb out” warning in the van (often listed as “Canbus” bulbs), only they were blue rather than white. At the moment we still have one incandescent light in the courtesy light circuit so taht we don’t get errors. We might take that one out and see if it makes any difference. If we were doing this again, we’d probably use RGBW strips. Those have an additional white LED in the strip for each red, green and blue one. Rather than trying to combine the three colors to get white, you can just switch to white from the controller. really appreciative of all you posts, super insightful. Paul, the metal piece that holds the bulb in place inside the plastic diffusers is a real pain. I use a screwdriver to carefully lever between the metal and the plastic on the end where the terminals are. The other end is a hinge. Lever the metal away from the plastic so that it “opens” the hinge up. Awesome! thanks for the quick response. So how did you wire in the LED’s? Did you just cut the wires for the old lights and use the existing wire for the rope LED’s? Charles, the LED lights are all powered by our house battery, not the vehicle battery. We ran dedicated cable from our fuse panel to switches and dimmers for the LEDs. I wouldn’t suggest trying to use the Mercedes wiring for your own lights. Although the interior lights don’t appear to be as sensitive as the exterior ones, it’s possible you could trigger a “bulb out” warning or otherwise get the vehicle upset. Hi! I’ve had a heck of a time trying to find information on this online. All the LED strip lights I see are sold with power supplies that convert 120V AC power from regular wall outlets to 12V DC power. If my original power source is 12V DC power coming from my deep cycle AGM batteries, do I still need a power source? Or can I just run the wire leads through a switch and straight into my DC fuse block? Kevin, you can indeed connect 12V DC from your fuse block directly to the LED strips. Even the dimmable strips tend to have a separate 120V-to-12V converter brick and then 12V in to the dimmer module. 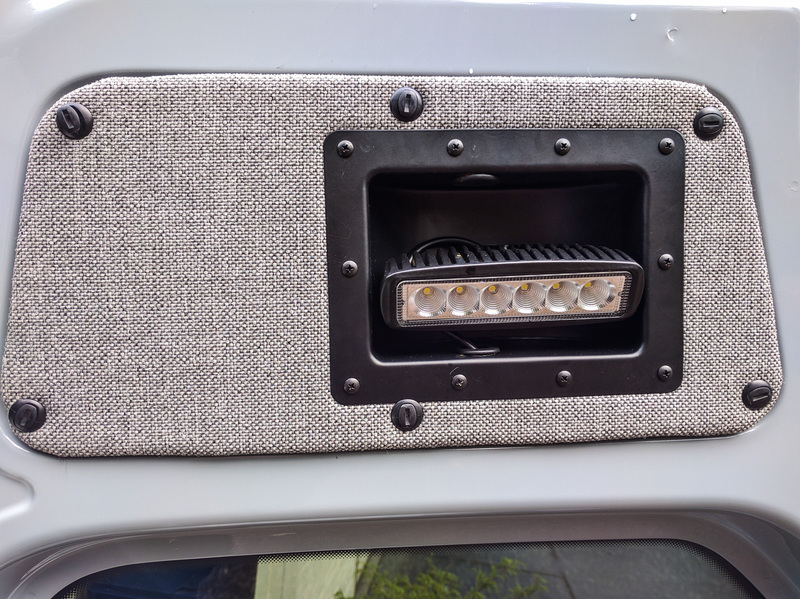 We bought some 5.5mm jacks with screw terminals on them that make it easy to wire directly in to most 12V dimmers and controllers for the LED lights.